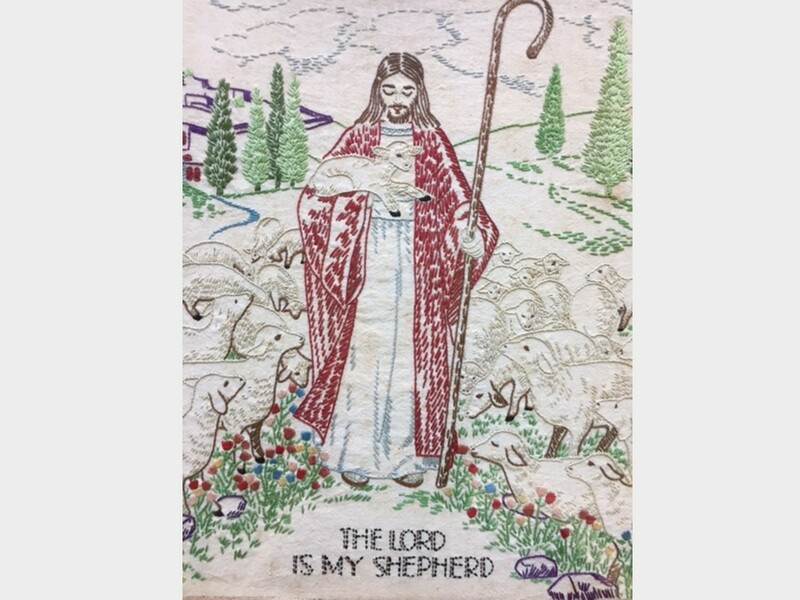 My grandmother created this needlepoint of Jesus as the Good Shepherd in the early 1930s. She was in high school. Money was tight and she used an old flour sack for the cloth backing. Grandma framed this piece and for over a half century it hung over her bed. I imagine her looking at it during her dark hours: when she lost a daughter to leukemia, as her first husband (my grandfather) struggled to breathe with emphysema, and as her second husband slipped into Alzheimer’s. By her death, all her friends had died. But my grandmother trusted Jesus. I like to think of how this artwork reminded her of his presence. A few years ago, when I was helping her move into an assisted living facility, she gave me the needlepoint. Today, it hangs in the foyer of our home. The image of Jesus as the good shepherd is comforting, for the shepherd’s role was to be a presence with and comfort for the sheep. On their own, the sheep were in danger, but with the shepherd watching over them, they could live in peace and without fear. Christmas can’t be Christmas without a reading of the story of Jesus’ birth in Luke’s gospel. It’s heartwarming. We can imagine being with those cold shepherds out on the hills surrounding Bethlehem, surprised by the angels song, “Glory to God in the highest heaven, and on earth peace among those whom he favors.” Yet, as the angels sang of peace, the world lived with a false sense of peace, enforced brutally by the legions of the Roman Army. As we learn in Matthew’s gospel, it would be just a matter of time before the frightened powers of the world set out to protect themselves by killing off children in an attempt to destroy a king who whose reign was a threat. The shepherds and the people of Israel longed for peace back then, as do we, 2000 years later. Just last week a Coptic Christian Cathedral in Cairo was firebombed, and in the city of Aleppo, innocent children are still dying. In our own country, domestic violence is a problem and then there are all the shootings in our own city. At times, peace on earth sounds just too good to be true. Yet, when you think about it, most of our lives are pretty peaceful. But even when they are not, Jesus can help us experience peace. Peace is what Jesus gives to the disciples and to the church. In the Gospel of John, peace along with love are signs that we are followers of Jesus. But it’s often overlooked. Instead of being at peace, we are frightful (even when things are going well). We run around at a hectic pace because we think everything depends on us—and I know I’m guilty of this as are many of you. But Jesus breathes out peace upon us. We might not be able to solve all the world’s problems and that’s okay because we should be filled with a peace that is unlike anything the world has to offer. Furthermore, our salvation is grounded not in what we do to save the world, but in the grace of God through Jesus Christ which is why we can be at peace when the world is in turmoil. We know where we’re going; we know the ending to the story in which we live. When we trust in Jesus and live in his grace, we can be at peace. The verse that I am focusing on this morning, verse 27, suggests that the peace Jesus offers will lighten our hearts and keep us from being afraid. Yet, we live in fear all the time. We’re constantly being told why we should be afraid because the people who sell the news knows that nothing sells like fear. Our children fear being unpopular and out of fear buy certain brands of clothes (and we continue this behavior into adulthood only the items become more expensive). Candidates, as we heard all too frequently from both sides in our past election, scare us into not voting for the other candidate. Way too little is said about what they’d do. Fear motivates us more readily than a positive message. You know, it’s interesting how thousands of preachers throughout history have used the fear of hell as a way to encouraging conversion. Yet, Jesus, who spoke of hell, never used the fear of eternal burning as a way to make converts. A recent article by John Piper was titled, “‘Trust Me or I will Hurt You:’ Does God Scare us into Saving Faith?” He concludes that God doesn’t operate in such a fashion. Scaring one into action is the way of “an abusive husband or peevish potentate.” Such tactics “obscure the truth that God acts out of fullness for our good, not out of need for our affirmation…” We glorify God by “enjoying him as the supreme treasure of the universe.” Our hearts overflow with joy and love, “a spontaneous response to the glory of [God’s] immeasurable perfections.” Our response cannot be coerced. Dale Bruner, writing on this passage, notes that “our relationship with Jesus is grounded in his grace, not on our obedience. This should give us considerable Shalom (or peace). Of course, Jesus’ peace is not like the peace offered by the world. The world promises us much and often fails to deliver. It’s the peace of shaky political allegiances, not the steadfastness of God. The peace the world promises is an absence of violence or war, but Jesus’ gives us (the church) the means of peace by sending us the Holy Spirit. Now this peace promised by Jesus won’t be fully realized in this life. That’ll have to wait till the kingdom has fully come. But we can enjoy the benefits in this life of knowing that our salvation and our long-term security is grounded in Jesus Christ. Such benefits means that we don’t have to worry or fret about the future. Jesus pronounces this peace upon the disciples as he is about ready to leave them and face the cross. It’s a parting gift, the assurance that despite evidence to the contrary, God is in control and working things out for our benefit. What does this peace look like? From the Hebrew tradition, the word Shalom addresses a state of well-being and also a reference to a state where justice is maintained. It implies that things are right in the world. In John’s gospel, the word connects to Jesus. Although John uses the word a number of times, he never fully explains it. But it’s linked to Jesus and at the end of John’s gospel, is tied to the forgiveness of sins. If our sins are forgiven, and we don’t have to live in fear of God’s wrath, we should be open to enjoying the peace Jesus offers. Our passage ends in an ominous tone. Jesus is leaving and the ruler of the world (Satan, who has entered Judas) is coming. The final showdown is about to occur. Jesus will be betrayed and crucified, but that’s all that the world can do to him. Love will beat out evil as Jesus will rise and will continue his work to save the world. For this, the disciples should be happy and rejoice. But first, they’ll be some dark days. Yet, despite the darkness, there is no reason for gloom or fear. They (and we) are to trust the Lord and to know, like sheep, that we are watched over by a good shepherd. I know I have told you about the short story written by Ferrol Sams, an author from Georgia who recently died, who wrote about Joseph, a friend of his who was a Christian from Lebanon. Joseph traveled back to Lebanon during its civil war in order to see his family, especially his grandfather, who remained there. Sams tells about how he prayed regularly while his friend was gone, but he “did not worry for there is absolutely no logic whatever for a Christian doing both.” I love that line. If you pray, there is no reason to worry. On this night in which Jesus prepares his disciples for the fulfilment of his coming, he wants them to breathe in his peace and not worry. When things are in God’s hands, we’ll be just fine. Think about all those things you worry over, those things that upset your heart, which keep you up at night… It might be the state of the world, or the concern over a wayward child or grandchild. It might be a concern over your health or your finances, or getting your Christmas shopping done. You might be worried about our nation or the future of our planet. Many of our concerns are such that as individuals, we can’t do a lot about them. We do our best, then we should turn them over to God. 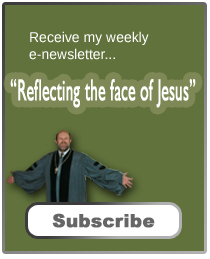 This Christmas season, as we contemplate Christ’s coming, evaluate yourself. Do you trust that God’s shoulders are large enough to take on all our burdens? Recall how Jesus calls to all who are weary and heavily burdened to come to him. Do you believe that even though we walk through the valley of death, God is with us like a shepherd? If so, you will enjoy the peace Jesus’ promises, and this Christmas will be merry. Amen. Gerard Sloyan, John: Interpretation, A Biblical Commentary for Teaching and Preaching (Atlanta: John Knox Press, 1988) 184. Neil Strauss, “Why We Are Living in the Age of Fear,” Rolling Stone, October 16, 2016 (http://www.rollingstone.com/politics/features/why-were-living-in-the-age-of-fear-w443554). Fredrick Dale Bruner, The Gospel of John: A Commentary (Grand Rapids: Eerdman, 2012), 847. John W. Martens, “The Peace of Christ,” America, April 25, 2016 (http://www.americanmagazine.org/content/the-word/peace-christ) . See Raymond E. Brown, The Gospel According to John XIII-XXI (New York: Doubleday, 1970), 653. See John 20: 21-23. William Klassen, “Peace,” Anchor Bible Dictionary, vol. V, (New York: Doubleday, 1992), 209. Ferrol Sams, “Saba” in The Widow’s Mite and Other Stories (New York: Penguin Books, 1987), 121. Another thought provoking message. Thank you. Being a first class worry-wart, your message gave me peace and guidance. Thank you and in spite of all the fear and turmoil in this world, may Your love of God and mankind afford you a Merry Christmas.